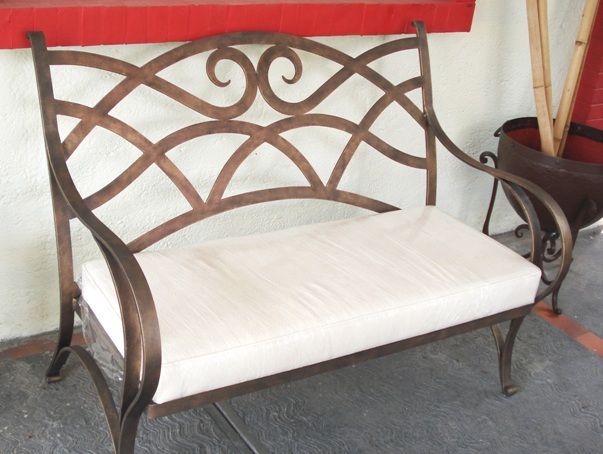 This beautiful wought iron bench features a warm patina finish and wide iron designs. This beautiful wought iron bench features a warm patina finish and wide iron designs reminiscent of musical notes. We love the flow and dynamism of the back seat. Bench seats two and can be placed inside or outside ... as a "Welcome" for your guests near the front door, an addition to a spacious bedroom or living room, or as a beautiful complement to your Mexican patio, pool area or landscape.